If you are running a beta version of Bulkr and do not wish to upgrade to the new version, it’s completely cool. But please note that there will no longer be any support for the beta version. Also, the beta version will keep functioning, at least few months, after which you will be prompted to upgrade to version 1. Further notice will be posted here. Once again, I want to thank everyone for supporting Bulkr and it’s development. All the feedback has been really valuable, and has made Bulkr what it is today. Install Bulkr FREE and if you would like to support it’s development & unlock all the features, please consider going PRO! Hey congrats on launching the Bulkr Pro! Hey Hanzo, thanks for your feedback! Wow this apps is so cool! I cant explain how much time this app has saved me. Best of all … IT WORKS! I’m backing up my stream now. Best $30.00 I’ve spent in a long time! Thanks!!!! Is video support on the horizon? I wish I would have looked at the Pro feature before I downloaded all my contents from Flickr in the large format. But, you are a lifesaver! I didn’t want to continue to pay for my account, but had a mishap and lost all of my earlier photos that were stored on Flickr previously. I purchased the minimum subscription and discovered the Bulkr program and have downloaded 7,801 photos back to a back up drive!! Thank you! 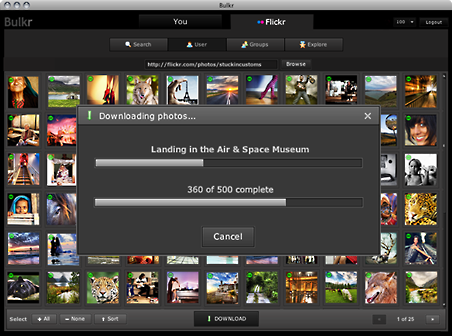 Previous Previous post: Bulkr: Over 2 million photos downloaded in 2 weeks! Next Next post: Bulkr recommended by Adobe!